The Escarpment is a difficult area to navigate and understand, and thus Escarpment climbers require a quality guidebook. Volume 1 gave us the first new guidebook to the Escarpment in a generation. 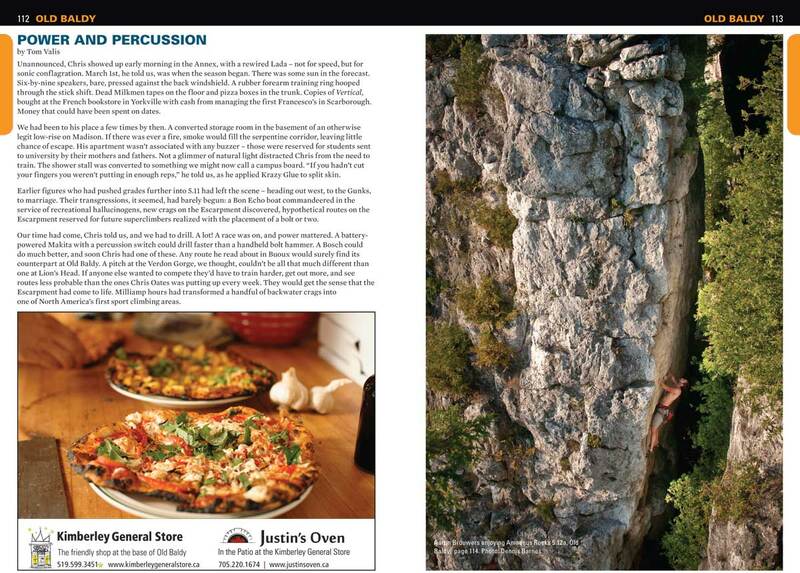 It made a down payment on a comprehensive view of a history-rich area that spans three hundred kilometres and offers a diversity of climbing styles. Volume 2 pays off the debt in full. Excitement will surely flow after reading just a few pages of the book. Its design and attention to detail and context set a standard for guidebook publishing. Volume 2 picks up the narrative with the Beaver Valley crags, home to four prominent crags: Metcalfe Rock, Old Baldy, Devil’s Glen, and The Swamp (the last three being predominantly sport climbing areas). The old guidebook provided inadequate information on Devil’s Glen, and, of course, The Swamp had yet to be developed. For the first time, this book allows climbers to plan a weekend trip with clear access information, route descriptions and photos, so that they can make the most of the precious time away from loved ones. I often overhear: "I was thinking about Devil's Glen, but I’m not really sure where it is. 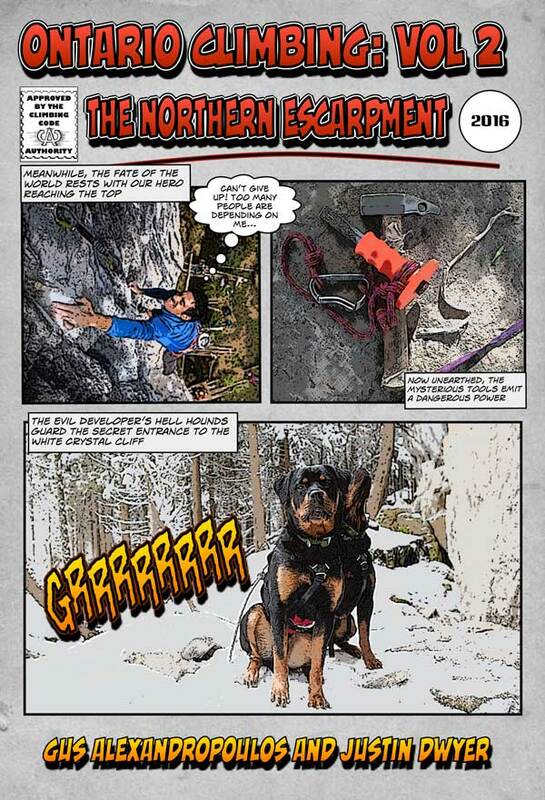 The last time I was out at an Ontario crag, I spent half the time trying to find the first route I wanted to climb." Trees obscuring clear views, a Gordian knot of trails, and unmarked sideroads all contribute difficulties to Escarpment climbing. Following a brief stop in Wiarton, Vol. 2 gets to the stuff that makes the covers of magazines. 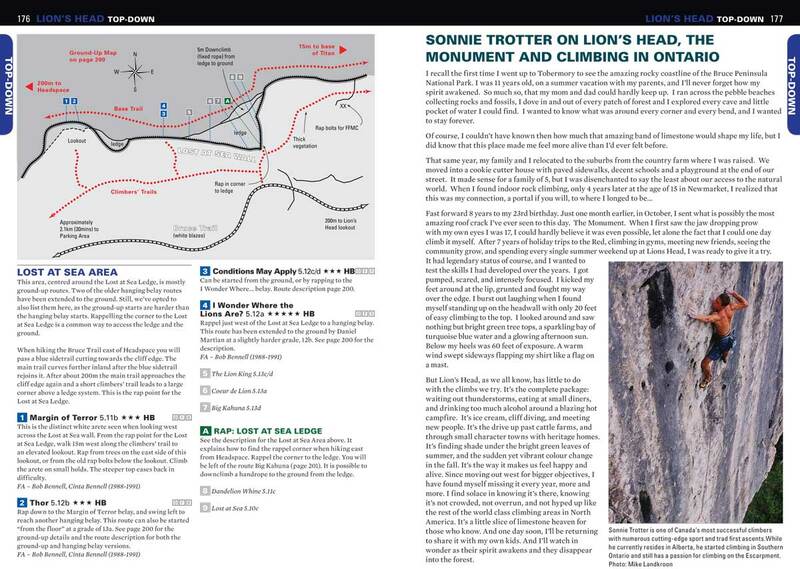 Lion’s Head announces its prominence at the beach in town. Sonnie Trotter questions his decision to move to Canmore, and motivates immediate and sustained training. Adventure awaits. If only it were so simple. Lion’s Head, as the guide makes you appreciate, is two cliffs. One, a top-down, lower-in, hanging belay monkey-show that has its moments, and another, modern, ground-up crag of world-class routes. The guide allows you to interpret the area either way, to full effect. The intimidation factor should now be replaced by a desire to get on these routes, which will stand as some of the best you’ll ever do in the genre. 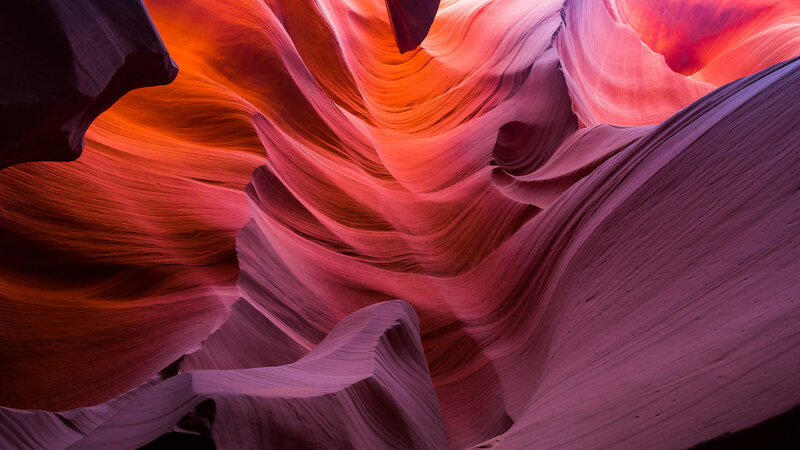 Where to lower in, how to experience the cliff as a relative novice, and solid beta all make for a compelling companion at the 45th parallel. Other areas on the Bruce – White Bluff, Cape Croker, TV Tower – get the same quality treatment as their southern counterparts. And the guide captures the beauty of places like Halfway Log Dump. Climbing areas, especially less obvious ones, are the products of human imagination. Vol. 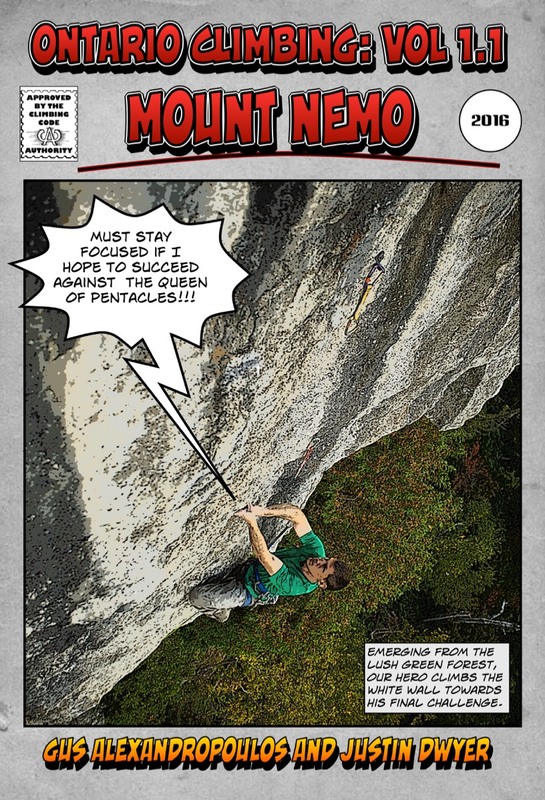 2 extends its colourful exposé of personalities and passions to the crags that set off the sport climbing revolution in Ontario and led the way in North America. It gives balanced emphasis to early protagonists and later architects of desirable routes. Concurrent with the publication of Vol. 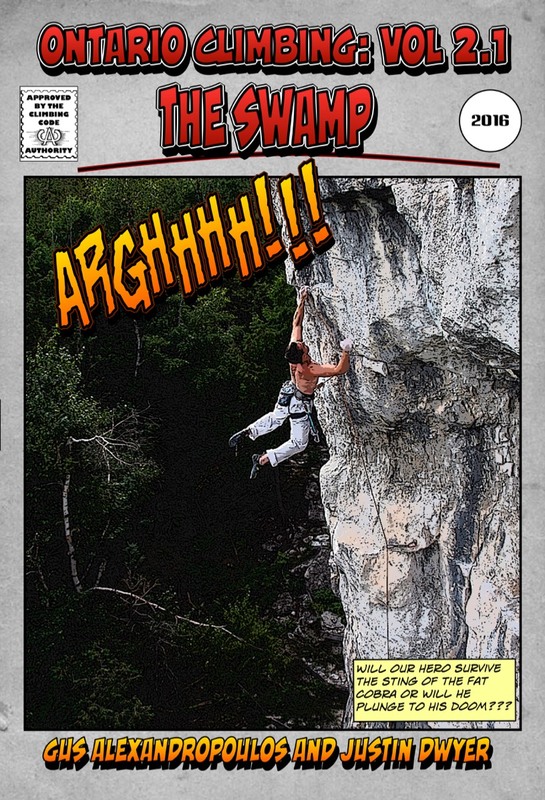 2, crag-specific digital guides for Mount Nemo and The Swamp are available on Rakkup. These offer a complementary “tactical assist” to the printed guides. Importantly, they completely remove the guesswork from route finding, assuming your batteries are charged, your phone is in a rugged case, and the DoD hasn’t shut down the GPS feed that day. The days of subjective assessments of the location of routes are over. Equally useful is a filtering function, which allows you to see a crag purely as a sport or trad crag – as you’ll typically want to do on any given day. And within a genre, you can see Mount Nemo, say, as a 5.10-only sport crag. The rental option is great for visiting climbers or those only passing through the sport on their way from tennis to auto racing. It’s been a long time coming, but The Escarpment in its totality is now back on the map. Its return is a testament to the unfaltering dedication of the authors. Tom Valis lives in Toronto has been climbing in Ontario for over 30 years. He travels extensively for work and climbing and is perhaps best known for his infamous Troll Wall ascent.